The Acid Mixture “Aqua Regia” Derives Its Name From The Ability To Dissolve? Jupiter's Largest Moons Are Referred To As The? Aqua regia, literally “royal water,” is formally known as nitro-hydrochloric acid and is one of the more corrosive acid mixtures around. The mixture derives its Latin name from its ability to dissolve the noble (or royal) metals gold and platinum. It is capable of dissolving the normally acid-resistant noble metals, a feat the base acids it is comprised of are incapable of, because each acid in the nitro-hydrochloric acid mixture performs a specific function. In the case of gold, the nitric acid oxidizes the gold into gold ions while the hydrochloric acid provides chloride ions; given enough time and acid, the gold is eventually dissolved entirely into chloroauric acid. The process can be reversed and the gold recovered from the mixture. A similar process occurs with platinum, but chloroplatinic acid is created instead. Aqua regia was the mode of discovery for the dense metals iridium and osmium; the two metals are found in platinum ore but do not dissolve in the mixture and instead gather at the bottom of the container. 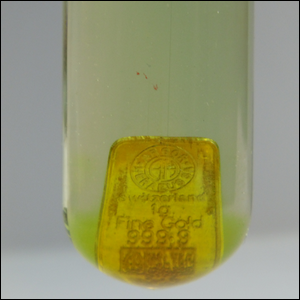 The primary uses of aqua regia today are for gold refinement, industrial etching, and specific analytical procedures. Image courtesy of Daniel Grohmann.